Defense Ash Carter exchanges gifts with Indian Defense Minister Manohar Parrikar following a welcome dinner in Goa, India, April 10, 2016. Carter is visiting India and the Philippines to solidify the rebalance to the Asia-Pacific region. NEW DELHI–The U.S and India are working to make it easier for the two countries’ militaries to coordinate during disasters or other emergencies, Defense Secretary Ash Carter said April 12. During a joint news conference with Indian Defense Minister Manohar Parrikar, Carter said the two countries have “agreed in principle” on a logistics agreement, and it could be finalized in weeks. U.S. defense officials said it will help the two militaries coordinate better, including in exercises, and also allow the U.S. to more easily sell fuel or provide spare parts to the Indians. Carter said the U.S. and India also expect to soon reach a second pact to improve the sharing of information on commercial shipping, in a move to beef up security on the seas. Carter said that while sharing logistical assets may seem like it should be automatic, it isn’t. Although some of that can be done now, through what officials called “workarounds,” the agreement will help expedite such transactions. While officials touted the signing as an important step, there was less progress on other programs the U.S. would like to partner with India on. 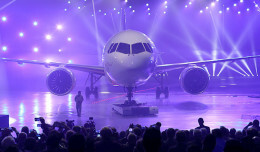 Those would include cooperation on the development of jet engines and aircraft carrier technologies. Carter on Monday noted that India wants to move to a flat-deck design of its aircraft carriers, he said the U.S. is “more than willing” to share its catapult technology used to launch fighter jets off carriers. Defense officials said that if India begins using the catapult technology, then there could be opportunities for India to buy U.S.-made FA-18 fighter jets or other aircraft that use that launching system. 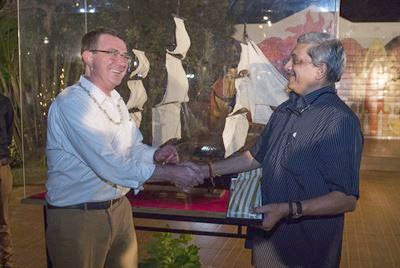 Last June, during a visit to India, Carter and Parrikar signed a defense agreement, as part of a broader U.S. effort to improve what has been a rocky relationship between the two countries. And he announced two $1 million joint research ventures. While small, defense officials say the two-year projects will set the groundwork for future collaboration. At the time, Carter acknowledged the difficulties on both sides in breaking through the red tape to achieve more development cooperation, but said things are moving forward. U.S. leaders have long hoped to partner more with India as it modernizes its military, but Indian leaders have been more interested in co-development opportunities than in simply buying American-made weapons. India has also been courting a strong business relationship with China. Beijing sees India as a market for its increasingly high-tech goods, from high-speed trains to nuclear power plants, while India wants to attract Chinese investment in manufacturing and infrastructure.